Another fun jaunt! This one for an article for the summer issue of Harbors Magazine. This time, I took the Kingston ferry over to Edmonds. The Kenmore Air Base on Lake Washington is just 15 or so minutes from there. I thought I was going directly to Roche Harbor on San Juan Island, but I was shuttled (by seaplane) to Lake Union. The short flight, about 10 minutes was very cool though and I had a young woman pilot! I was the only one on board, too but chose to not fly right seat as the windows in the back are bigger! Even though it was a misty day, the view was spectacular! At Lake Union I changed planes to the bigger Otter that seats 11 people. I flew right seat which is always a kick, especially taking off and landing! The flight is less than an hour and we came in from the west with the marina laid out below. OK - so this is where the money is! Roche Harbor Marina puts Newport Beach, California to shame. These boats are big and well maintained, and you can tell they are used as boats, not party platforms. But I wasn't there to look at boats! Hawk Pingree, one of the owners of the San Juan Island Distillery and Westcott Bay Cider picked me up outside the lovely old Roche Harbor Lime & Cement Works building that sits right on the dock. He was driving a cute little blue Mini with the license plate Distiller - so I couldn't miss him. Of course, I could have walked but it was a little drippy so appreciated the ride. The next couple of hours was very educational and I learned a lot about cider making and distilling spirits! The ultimate goal behind the distillery is to produce Calvados, the lovely apple brandy popular in France. But that takes at least three years to mature, so Suzy and Hawk decided to produce something that takes a lot less time - gin! And what makes their gin so special is that they forage for the botanicals to make their gins. Things like rose hips, orris root, madrone bark and local juniper berries. They brew small batches in their Portuguese pot still and vary the ingredients, depending on the season. The also brew a wide range of othe spirits including Apple Eau de Vie, Blackberry Brandy and cocktails like Red Sky at Night, a popular one with the yachties, which is a clever blend of Spy Hop Gin, Lavender and Wild Rose Liqueur and Westcott Bay Cider Syrup. Westcott Bay Cider bucks the flavoring trend and produces three wonderful ciders - Traditional Very Dry, Traditional Dry and Traditional Medium Sweet - all of which have clean, clear flavors. Even though it was a gray day and at times, rather drizzly, there was a steady flow of visitors ready to taste test all the wares! And as I considered myself a visitor, I taste tested right along with them! And I was so impressed! 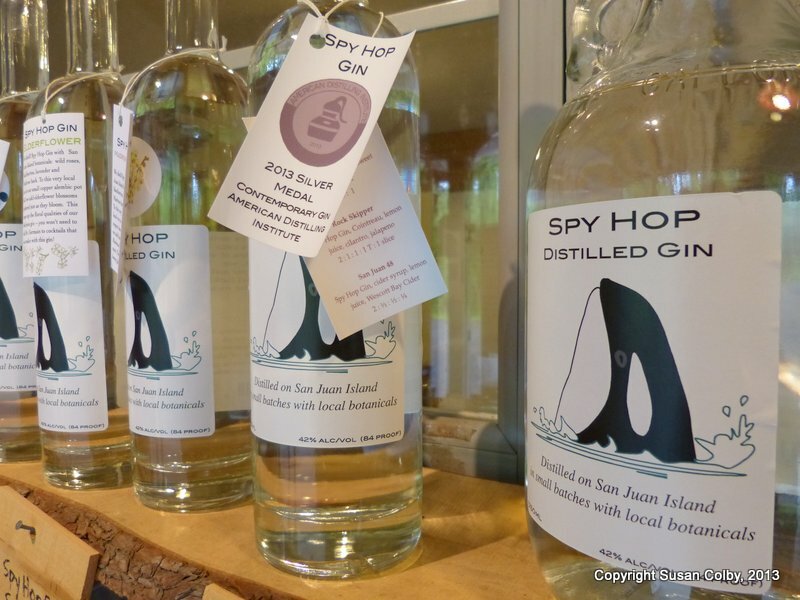 I'm a gin lover so when we got to the gin tasting... well, I broke down and bought a bottle of Salish Juniper Spy Hop Gin! It's distilled using wild roses, blackberries, lavender and madrone bark with local tiny juniper berries. This is the most amazing gin - sip it neat - I cannot imagine diluting it or adding anything to it, the flavor is just so special. Time ran out and Hawk took me back to the harbor and I watched my ride materialize over the water and gently land in the harbor among all the boat, then taxi to the dock. We loaded up and made the return flight back to Lake Union and then to the Kenmore base.